One of the best parts of hosting your Membership on Podia is the seamless integration across all of your digital products. Giving your Members access to your other Podia products, like your Online Courses and Digital Downloads, only takes a couple of clicks. 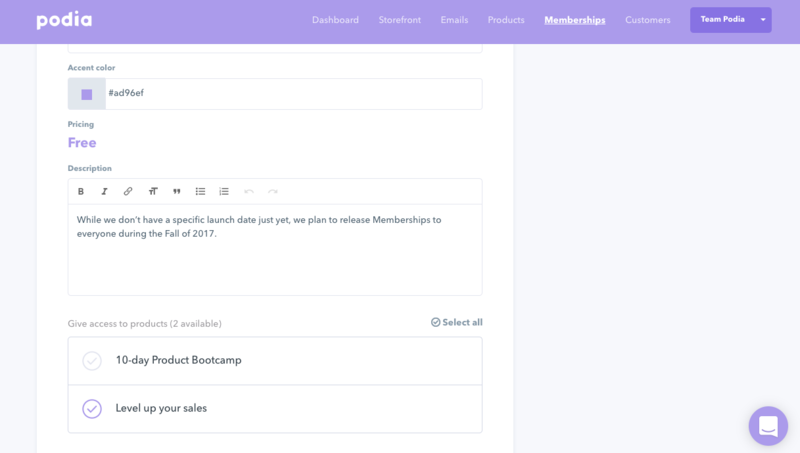 Step 1: Click the "Memberships" button in the top sidebar, and then choose "Plans." Step 2: Click on the plan you'd like to add other products to. Step 3: Scroll down to "Give access to products", and click on the products you want to add. Step 4: That's it! Members in that plan will now have access to the products you've selected. If you have more questions about how to add products to your Membership, reach out to us at [email protected] (or click the icon below to chat with us! ).